ITS THAT SPECIAL TIME OF YEAR AGAIN !!!! MONKEY JOE”S BIRTHDAY EXTRAVAGANZA !!!! COME VISIT MONDAY , FEBURARY 15TH FREE COTTON CANDY & DOORPRIZES INCLUDED WITH A REDUCED PRICE ADMISSION !!! 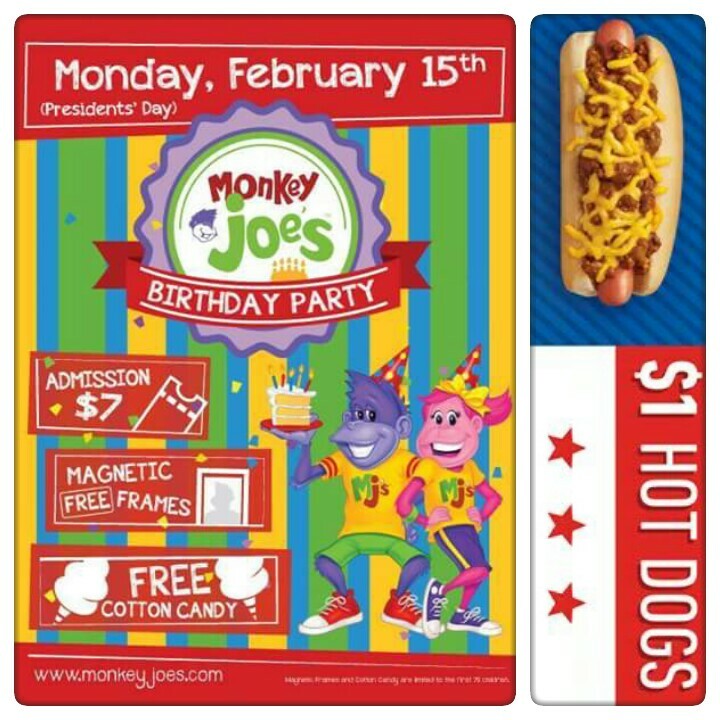 Sonic is celebrating Presidents Day with $1 Hot Dogs! Celebrate President’s Day at SONIC, all day today.Includes 6-inch All American Hot Dog & Chili Cheese Coney only. Tax and add-ons cost extra. Offer valid 2/15/2016 only at participating locations while supplies last. last part 🙂 I handle such info much. I had been looking for this certain information for the while.